Are real estate prices too expensive in France ? Real estate prices for the first quarter of 2013 have just been published. It’s interesting to compare them on a long time period with other prices or income. That’s what I’ve done in this post. I have taken households’ disposable income, the CAC 40 stock index (ex-dividends) and the consumption price index. I took attention to avoid taking a peak or a through as starting date. That’s why I’ve started in 1990. 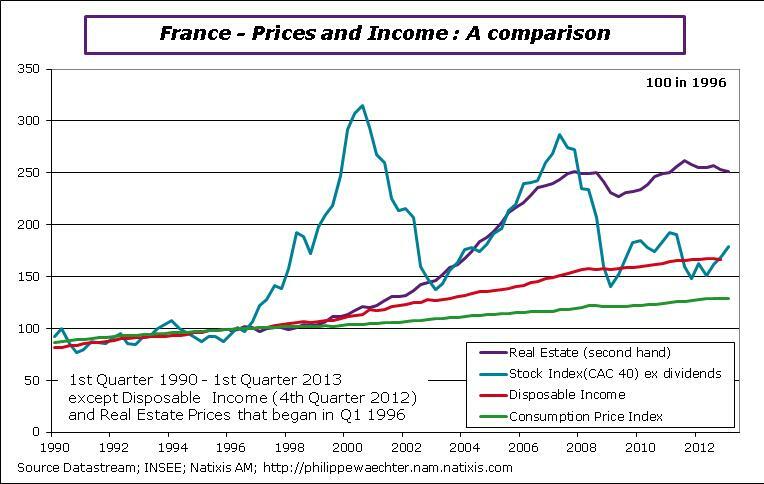 But the comparison really starts in 1996 as real estate price index published by INSEE begin in 1996. Growth is not on an upside trend, that’s the conclusion we can have after surveys publications today in China and in the Euro Area. In both regions, activity was shrinking in May. Just published last week – Three charts to characterize the Euro Area and allow to answer the question: Is Euro crisis over? Three statistics that have been published in the week between May 12 and May 19 characterize the economic situation in the Euro Area. First it is the GDP growth number for the first quarter of 2013 then it is the external trade balance for March and then the detailed publication of the inflation rate for April. The number of jobs in competitive sectors dropped by -0.1% during the first quarter of 2013. 20 300 jobs have been lost. The chart below shows that employment profile is not linear. GDP dropped by -0.2% in the first quarter of 2013 . It was the same number during the last quarter of 2012 (numbers are -0.65% and -0.8% at annual rate respectively). Compared to the first quarter of 2010 economic activity is -0.4% lower. Carry Over growth for 2013 was -0.3% at the end of the first quarter. 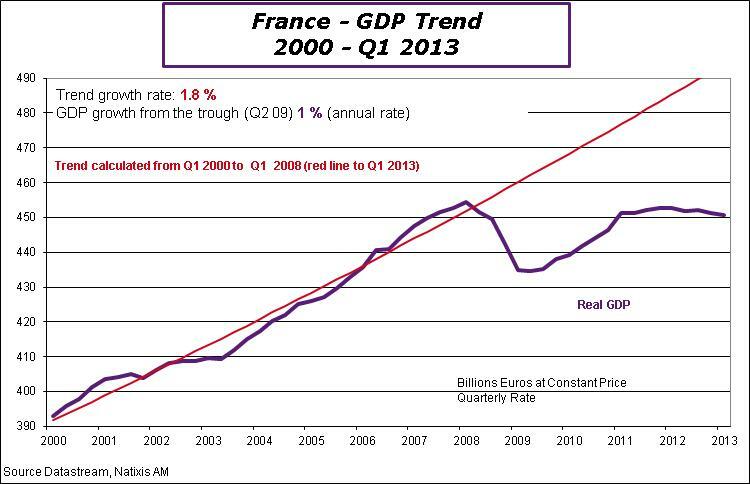 The most problematic issue on France is the GDP profile. On the chart we see that since the first quarter of 2011 its level is almost unchanged. The main challenge for the government economic policy will to change this profile on the upside as such a trajectory is consistent with a reduction of employment. Only companies’ investment can change this profile rapidly, but a stable financial and fiscal framework is needed to reduce uncertainty. GDP was up by 0.1% during the first quarter after a deep drop of -0.7% in the last quarter of 2012 (+0.25 and -2.7% at annual rate respectively). Compared to the first quarter of 2012 GDP level is lower by -0.25% and carry over growth for 2013 is negative at -0.3% at the end of the first quarter. 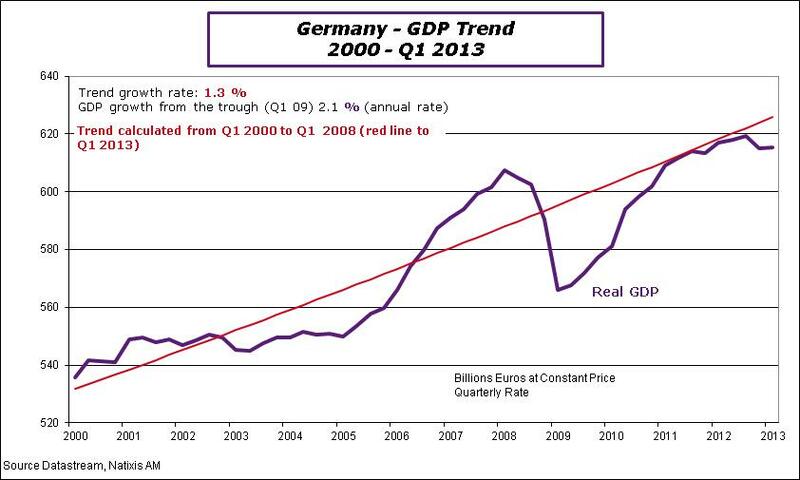 German GDP profile does not show a strong momentum. It’s weaker than, expected. 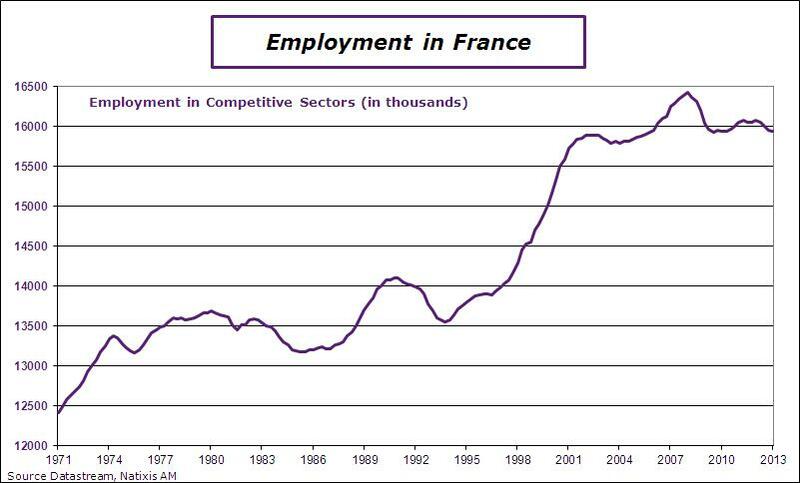 The chart below presents the French Industrial Production index on a very long period. We clearly see 3 different episodes. During the 60’s growth was really strong, the slope was steep. After the first oil shock growth was slower, the slope was milder than before. The third episode started in 2008. It represents a deep break in industrial activity.